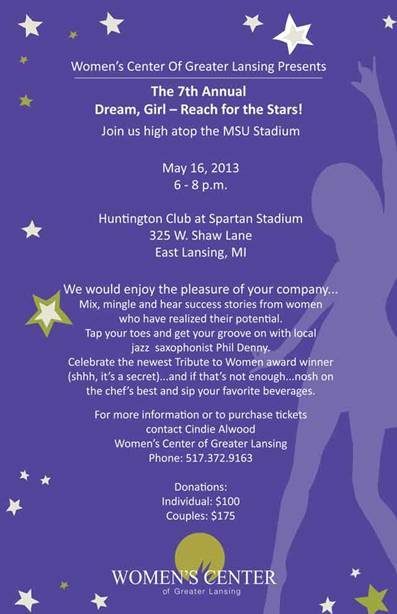 Tonight I will attend the “Dream, Girl – Reach for the Stars” Tribute to Women award ceremony by the Women’s Center of Greater Lansing as a nominee. I am humbled to receive this nomination for so many reasons. 1. Success in breaking traditional barriers to achieve success/leadership status in their profession. 2. Serve a role model for other women. 3. Actively engage in their profession. 4. Achieve their potential i.e. overcome obstacles to achieve their goal. I share this honor with a long list of amazing women Judi Brown Clarke, Kristine Hynes, Janene McIntyre, Laurie Robison, Kelly Rossman, Paula Thompson, Lisa Wiley Parker, Jan Williams Mayhew and Jessica Yorko. My fellow nominees are power hitters in Lansing contributing and changing our community for the better. Judi Brown Clarke is an Olympic medalist who has spent her life committed to education and diversity. Kristine Hynes Senior Associate to the Dean for College of Agriculture and Natural Sciences Human Resources & Budge. Janene McIntyre, Lansing’s new city attorney. Kelly Rossman, Lansing’s premiere public relations professional. Paula Thompson, of the Biggby coffee chain family. Lisa Wiley Parker, a recruiter who created a volunteer career networking group to help displaced workers get back on their feet. Jan Williams Mayhew, a financial consultant who created Operation Santa which helps children during the holiday season and throughout the year. These strong, passionate women deserve recognition for their courage and commitment to our community. I can’t believe my name or Just B Yoga is in the same league with this group of leaders and game-changers! I merely want to share yoga/tai chi/meditation in hopes it helps us find wellness and maybe decrease some stress. We have a humble yoga studio on the other side of the tracks. We aren’t clothing the homeless or helping people find jobs. We just help them learn to breathe and move and maybe find a way to smile in rough times. We accept donations so money is tight. Then I read Yvonne LeFave’s nomination and see Just B Yoga and Free Being Yoga Network through her eyes. “I’ve watched Belinda Thurston take a dream of hers and make it grow into something beautiful. She left a high-stress position with the media and opened up a yoga studio. Not just ANY yoga studio, but one in a troubled neighborhood — and made the studio donation-based… She’s taken a low-impact practice and used it to make an impact, a positive change, in her immediate surroundings and in Lansing as a whole. She’s built community where once folks lived in isolation… She’s used yoga as a vehicle to reach out to youth, to the homeless, those who typically would not see themselves as yoga practitioners: folks who are bigger or taller or older; folks who are all shades of the human family rainbow; folks who are gay, lesbian, bisexual, transgendered or questioning; folks who are struggling with addictions and/or depression and anxiety. I’ve seen such a variety of folks come to Just B Yoga with whatever their struggles may be and for a time … just be. What a gift she brings to Lansing! I embrace tonight’s event as an opportunity to spend time celebrating and getting to know people who are serving with positive action. In the end, it’s our collective efforts that shape our community, create our sense of place and make a difference.